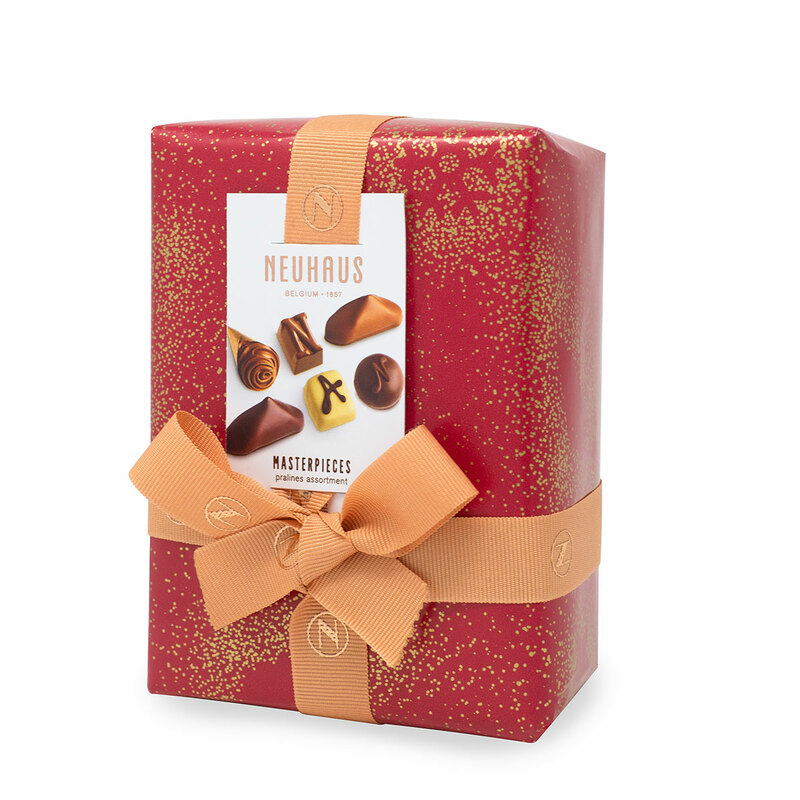 Surprise your friends, family, and colleagues with this festive round gift box filled with Neuhaus chocolate. A unique round red gift box is decorated with shimmering golden glitter. 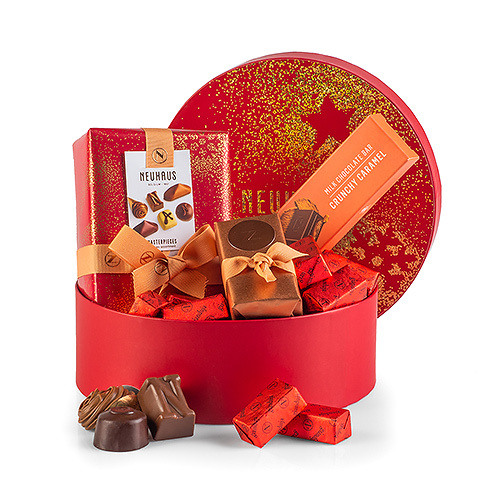 Inside the special box is a delicious assortment of Belgian chocolate treats. The Timeless Masterpieces 250 gram ballotin is all dressed up for the holidays in rich red with a gold sparkle. A decadent assortment of 37 milk, dark, and white chocolates offers a delicious array of fillings, including fresh cream. A charming mini ballotin presents two delightful chocolate truffles. 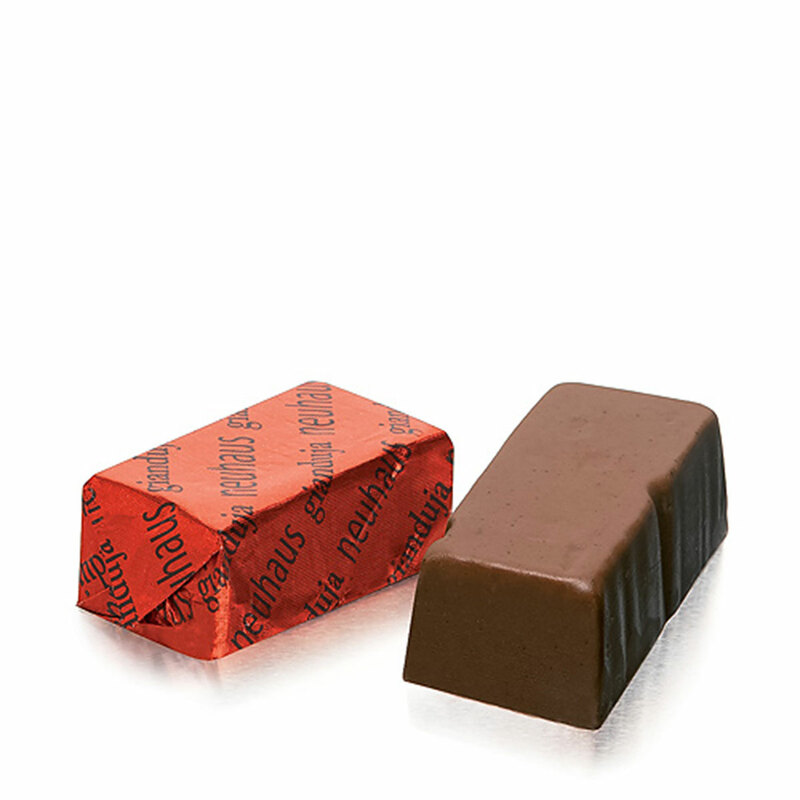 Discover 9 tempting red foil-wrapped velvety Gianduja chocolates. The gift also contains a bar in milk chocolate with crunchy caramel. Make someone smile with this box of sweet chocolate treats from Belgium! Ingredients: Sugar, cocoa mass, whole milk powder, cocoa butter, roasted hazelnuts, butter (contains milk), glucose syrup, palm oil, roasted almonds (tree nuts), cream (contains milk), butter oil (contains milk), coconut oil, stabilizer: glycerol of rapeseed, wheat-flour, flavours, emulsifier: soy lecithin, skimmed cocoa powder, stabilizer: sorbitol of wheat, palm kernel oil, sunflower oil, coffee, pecannuts, acacia honey, rice flour, walnuts, rapeseed oil, whipped cream (Isigny) (contains milk), vanilla, candy syrup, salt, salted butter (isigny) (contains milk), raising agent: sodium bicarbonate, milk sugar, milk protein, skimmed milk powder, invert sugar, caramel (caramelized sugar), salt (Guérande), cinnamon, soy flour, malted barley flour, thickener: guar gum, xanthan gum, corn oil, enzyme: invertase, spices, emulsifier: rapeseed lecithin, malt flour (wheat), water, acid (citric acid), colour: paprika extract, colour: beta-carotene, emulsifier: sunflower lecithin, wheatstarch, spices.